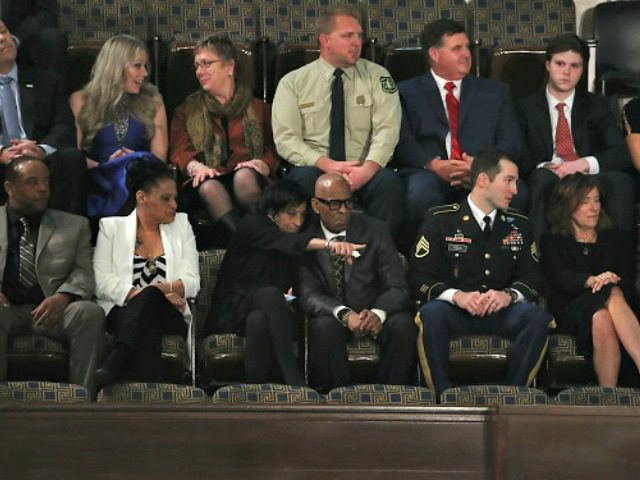 President Donald Trump delivered an energetic State of the Union address on Tuesday, pointing to heroic Americans to make his case that America was strong. Trump’s guest box was packed with Americans who stood up to help their fellow citizens in need. He celebrated the Cajun Navy for volunteering to help their fellow Americans in the hurricanes; Coast Guard Petty Officer Ashlee Leppert for saving over 40 lives; Army Staff Sergeant Justin Peck, who saved the life of his comrade Kenton Stacy in the fight against ISIS; and firefighter David Dahlberg, who rescued 60 children trapped at a California summer camp. To highlight patriotism, Trump pointed to Preston Sharp, a 12-year-old boy who started a mission to place 40,000 flags at the graves of veterans on Veterans Day. “Preston’s reverence for those who have served our Nation reminds us why we salute our flag, why we put our hands on our hearts for the pledge of allegiance, and why we proudly stand for the national anthem,” he said. Trump also recognized business owners benefiting from his tax reform plans and a welding employee who also got a tax cut. He told the story about Albuquerque Police Department officer Ryan Holets and his wife Rebecca, who adopted a young unborn child from a homeless woman who was addicted to heroin. 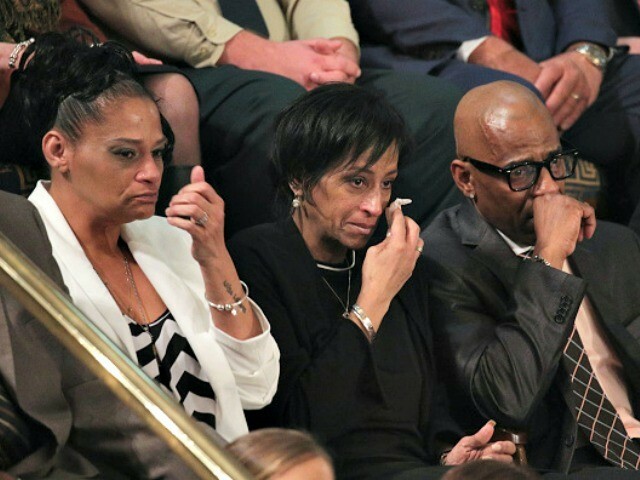 Trump pointed to surprise guests in the First Lady’s box to highlight the tragic story of Otto Warmbier, who died after being imprisoned in North Korea, bringing his family members to honor his memory. Trump also brought a man who escaped North Korea on crutches, Ji Seong-ho, to highlight the atrocities of North Korea. “Seong-ho’s story is a testament to the yearning of every human soul to live in freedom,” he said. Now that he is in America, Seong-ho now has a new leg, and he triumphantly waved his crutches in celebration. But the president also recognized people who suffered in the United States as a result of failures of the American system. He pointed to two fathers and two mothers — Evelyn Rodriguez, Freddy Cuevas, Elizabeth Alvarado, and Robert Mickens, who lost children to gang members who were in the country after taking advantage of loopholes in the immigration system to remain in the United States. To highlight the ongoing fight on the border, Trump pointed to Homeland Security Investigations Special Agent Celestino Martinez for his work to arrest MS-13 gang members. Trump concluded that the American people would seize the “new American moment” to fully live the American Dream.